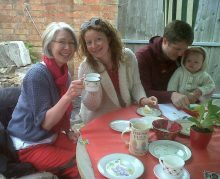 Our Strawberry Cottage Tea Room offers light lunches, teas, coffees, cakes and Sandra’s famous Cream Teas. We are OPEN and Closed from the end of AUGUST If you would like to hire it for a party / meeting/ group visit contact Sandra on 0116 2774627. We believe in providing local food as much as possible so use Ringswood ice cream from Pailton near Lutterworth, local eggs, veg when possible and local shops. 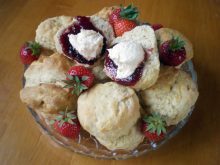 We provide light lunches, teas to include Delicious Cream Teas with Sandra’s home made scones with a variety of Sandra’s Jams although Strawberry is still the favourite! We will have a “Jam of the week ” when we are in full swing so that other jams can be tasted. We are very flexible and you can take your refreshments into the play barn to stay with the children using paper cups and plates for safety. ONLY FOOD PURCHASED at the tea room is permitted. We cater for all ages, babies, toddlers, mums, grannies bikers or who ever! We keep things simple but can cater for that special occasion Parties, Hen do’ s and weddings even! Our tea room extension with wood burning stove is used during the year by our regular KNIT-PICKERS knitting group every THURSDAY 7.30 – 9 30. We hire the facilities out for small workshops, meetings, parties and charity events.